See the biggest acquisitions for Google, Apple, and Amazon. In July 1987, Microsoft acquired Forethought for $14M in cash. Forethought’s key product, PowerPoint, was subsequently bundled into Microsoft Office, allowing Microsoft and PowerPoint to dominate the presentation software market. This is regarded by some as one of the best acquisitions in history. Download the entire report to see how Microsoft competes on artificial intelligence, gaming and open source software while keeping customers loyal. 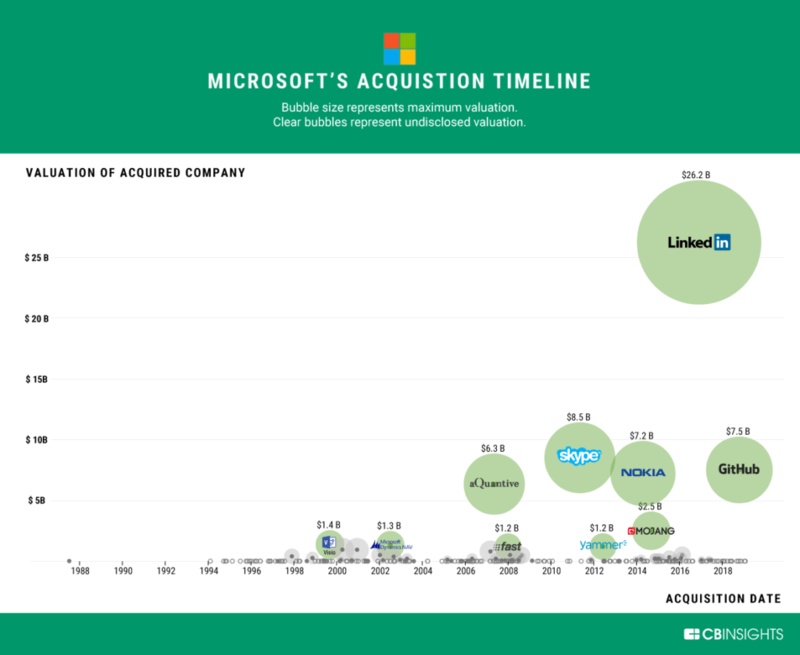 Since then, Microsoft has gone on to make more than 250 acquisitions. But where has it written its largest checks? Using CB Insights M&A data, we made a visual timeline of the largest acquisitions in the company’s history. See the top 10 list below. 1. LinkedIn ($26.2B, 2016), the business and employment platform, is by far the largest acquisition in Microsoft’s history. 2. Skype ($8.5B, 2011) is a video chat and internet communications service. 4. Nokia’s Devices & Services Business ($7.2B, 2014) was acquired by Microsoft in 2014 — though Microsoft wrote off the deal less than 2 years later, declaring the experiment a failure and signaling a restructuring of its phone business. 5. aQuantive ($6.3B, 2007) was the parent company of a group of digital marketing service and technology companies that included Avenue A, i-FRONTIER, and Atlas DMT. 6. Mojang ($2.5B, 2014) is the maker of the popular online game Minecraft, which has sold at least 144 million copies across numerous platforms and is the second best-selling game of all time (behind only Tetris). Read more about Microsoft’s gaming acquisitions here. 7. Visio Corporation ($1.4B, 1999) was a software company based in Seattle, Washington. Its principal product was a diagramming application software of the same name. Since being acquired by Microsoft, its division continues to develop the application under the name Microsoft Visio. 8. Navision ($1.3B, 2002) provided a suite of accounting applications for small and medium-sized businesses. 9. Yammer ($1.2B, 2012) was a private social network for businesses that allowed users to share ideas, collaborate on projects, ask questions, and solicit feedback. 10. Fast Search & Transfer ($1.2B, 2008) developed software solutions focusing on enterprise search. It is now known as Microsoft Development Center Norway. Microsoft has spent over $63B for its top 10 deals (roughly 7% of its current market cap). All of the top 10 deals had valuations greater than $1B. Navision ($1.3B, 2002) was one of Microsoft’s earliest $1B+ acquisitions and remains its eighth largest deal. Microsoft’s $26.2B acquisition of Linkedin in 2016 was by far its largest deal.